Over 10,000 spectators gathered at the Vallelunga Circuit to watch Valentino Rossi on four wheels, as the MotoGP World Champion teamed up with Andrea Ceccato and Alessio Salucci in a Ferrari 430 prepared by the Kessel Team. Fog forced the opening laps of the endurance race to be driven behind the safety car, but it was Rossi who started behind the wheel and again took over in the sixth hour. However, there were problems for the Italian trio, as mechanical issues and an outbreak of fire in the closing stages prevented them from challenging for victory. 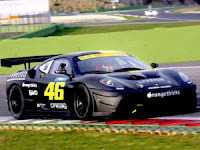 Rossi and his team-mates eventually finished third in the GT3 class, behind the Corvette of Emanuele Pirro, Carlo Graziani and Elio Marchetti and the Ferrari 430 of Forgione, Carugati and La Mazza.